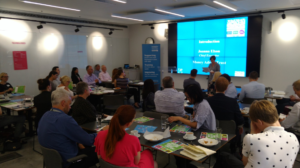 The Trust’s Insight and Innovation Grants Officer Timon Scheven blogs about our launch of the ‘Nudging Tools for Money Advisers’ toolkit, developed by Behaviour Change. It was fantastic to see so many people from across the advice sector, government and creditors at the launch this morning – the lively discussion highlighted the interest in how we can use behavioural science to better engage and support people with unmanageable debt. Joanna Elson, our chief executive, really set the scene for me when she talked about how the advice sector has impressive expertise and empathy in working with people in debt, but is still on a journey to understanding how to best give advice (and raise awareness of advice) so that it ‘lands’ as intended with the people we support. Essentially giving (and signposting to) good advice in a way that consistently enables people to take action or change their behaviour for the better.  This idea is at the heart of our Innovation Grants programme; trying new innovative ideas to make debt and money advice work better. 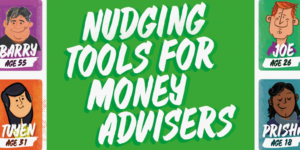 We are delighted that we were able to fund Behaviour Change to develop the Nudging Tools for Money Advisers toolkit, which can be download here. The design files to any of the tools within the toolkit can be requested from Behaviour Change. This means that organisations can adapt and make the tools their own, in their specific context. Picking up on Adam Sharples’ final thought of the morning; people are people and we need to continue to put ourselves in their shoes; understanding their thinking and feelings is so important. Sometimes the actual process of giving advice and our set way of doing things gets in the way of supporting the best outcomes for people. By creating space to test new ideas, based on how people act in practice, we can find better ways to influence people’s behaviours to help them make the best decisions. This is the approach applied by Behaviour Change in developing the toolkit and how the BE:Secure project managed by Hyde Housing, found its origins through working with partners on the London Housing Financial Inclusion Group. The BE:Secure project has resulted in an increase of client engagement to approx 82%, compared to approx 60% before. Similarly Affinity Housing, one of the housing associations who tested the toolkit, saw a 20% rise in their clients taking actions as a result of introducing the nudge techniques alongside their telephone support. The nudging pilot project, run by RCJ Advice, saw their no show decrease by 30%, and I’m pleased to say our own mini pilot of introdu cing nudging text messages when our advisers at National Debtline contact people about DROs resulted in a ‘no contact rate’ is down by 7%. These results are promising and testament that nudge theory really can work! However, we also discussed challenges, including how measuring the impact can be time consuming and resource intensive – difficult when organisations already face resource constraints. As discussed this morning, there are opportunities to test how nudge tools can benefit people by running mini tests over periods of weeks or just a few months. Not every agency will be able to run a full randomised control trial – the gold standard for evaluation – but there will be simple things that can make a difference. Some of the tools and mini-trials addressed the issue of getting people into advice – or to turn up for their appointments. Both of these are on-going challenges for the sector, and ones where new approaches could make a real difference. It was also great to hear from creditors and representatives from the public sector. A question that stood out for me was whether these approaches could help with supporting creditor/or government to send people to debt advice? For example creditors regularly recommend that their customers contact advice agencies (by phone or letter), but customers don’t always follow up. While nudge alone is unlikely to be the solution, there may be ways to use these principles to make the journey easier and improve contact rates. We concluded that ‘we haven’t cracked it yet’ and there are opportunities to do more. As I mentioned at the start of this blog, do let us know what you think about the toolkit, and watch out for our Wiseradviser training on behavioural science that will be coming out in the Autumn. For more information about the Innovation Grants programme, get in touch at Timon.Scheven@moneyadvicetrust.org.